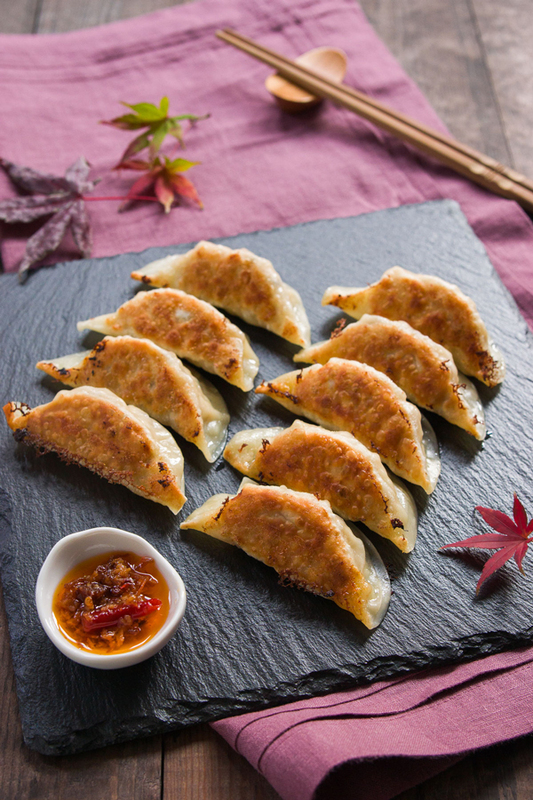 Gyoza, derived from the Chinese dumpling Jiaozi, are a popular Japanese dumpling that’s both steamed and pan-fried. This gives these potstickers a crisp golden brown bottom and slick noodle-like top, which is like having both a fried dumpling and steamed dumpling all in one bite! 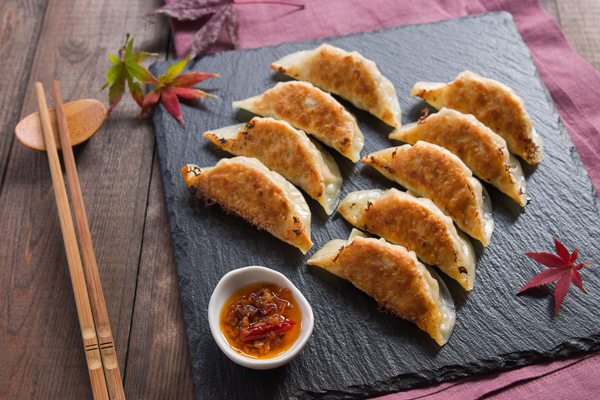 While traditional Gyoza is made using ground pork, cabbage and garlic chives, it’s a very versatile dumpling and can be filled with anything from Banana Cheesecake to Apple Pie Filling. 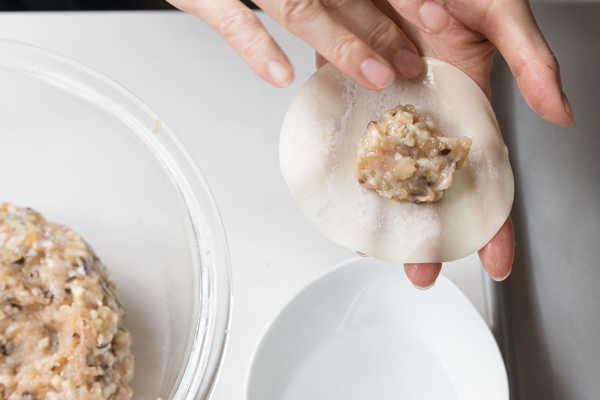 For this lighter version of the porcine classic, I’ve filled the gyoza with ground chicken, sweet onions and fragrant shiitake mushrooms. Although the pleated folds along the edge may merely look like a decorative flourish, they actually have a function. 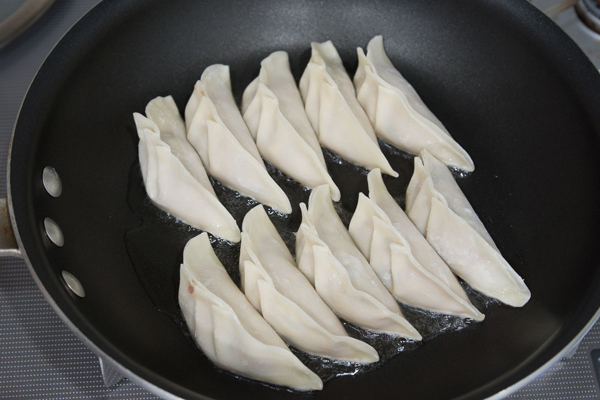 The pleats cause the dumpling to curl, which in turn provides a flat bottom and stable base that allows the gyoza to stand upright in the pan so only the bottom gets browned. 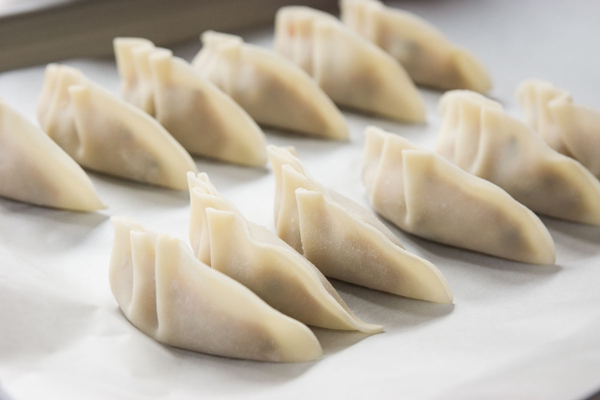 There are a few gyoza/potsticker presses that are supposed to make this easier, but the pleats they make are more decorative than functional, which is why I’d encourage you to try and fold these by hand. Perhaps I’m just weird, but I actually find something calming and meditative about folding dumplings once I get into the groove. By your fifth dumpling, you should have the pleating down, and by your 10th you’ll be cranking out potstickers like a pro! These Chicken Mushroom Gyoza go great with a sauce made from rice vinegar and soy sauce or even just a bowl of your favorite Asian hot sauce. I used some XO Sauce I picked up the last time I was in Hong Kong, but Sriracha or Sambal Oelek would work great as well. 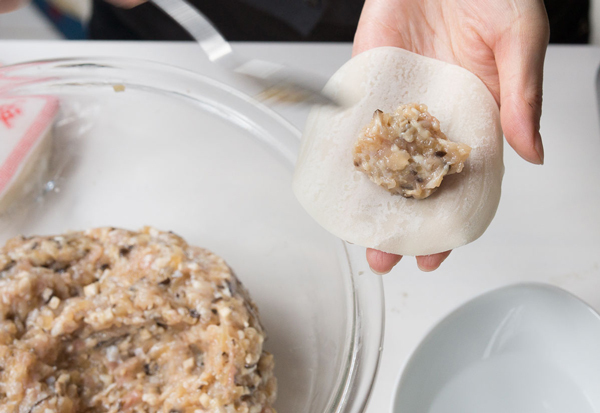 These Japanese dumplings are both steamed and pan-fried to give them a complex texture. 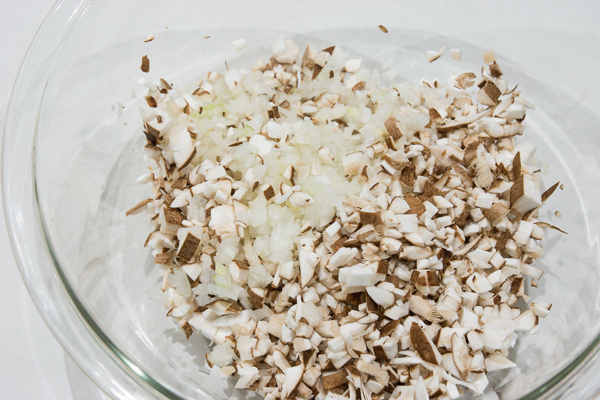 Put the chopped shiitake mushrooms and onions in a microwave safe bowl, cover with plastic wrap and microwave at 600 watts for 4 minutes, or until the onions are almost tender. Add the chicken stock, and let the mixture cool to room temperature. 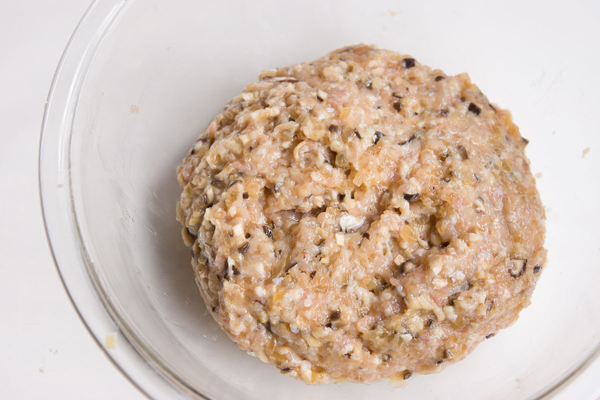 Add the ground chicken, ginger, oyster sauce, sesame oil, potato starch, salt and white pepper. Then put some gloves on, and mix the mixture well with your hands until well combined. Place a wrapper in the palm of one hand and use your other to scoop about a tablespoon of filling into the center of the wrapper. 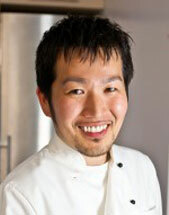 Wet the index and middle fingers of your free hand with the water, and wet the rim of the gyoza wrapper. Fold the wrapper over the filling, adding pleats along the top edge. Make sure the dumplings are completely sealed. Repeat until you run out of wrappers or filling. Spread 2 teaspoons of oil around a non-stick frying pan. Line the gyoza up in rows and then turn on the heat to medium-high. Fry the gyoza until they just start to take color on the bottom. 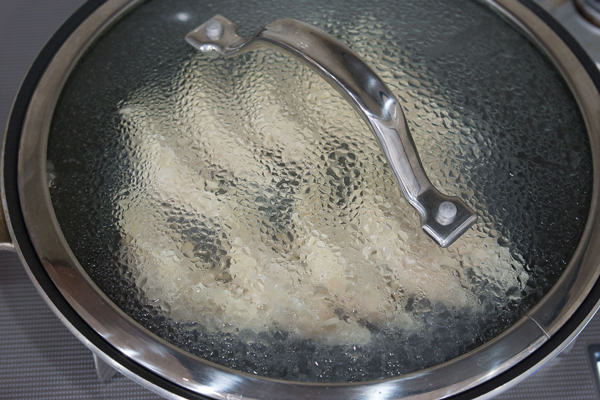 With a lid ready to immediately cover the pan, add 1/4 cup of water to the pan and quickly cover. Be careful as it will tend to splatter when you add the water. Let this steam until there is no water left (about 3 minutes). Remove the lid and fry the gyoza uncovered until they are crisp and browned on the bottom. 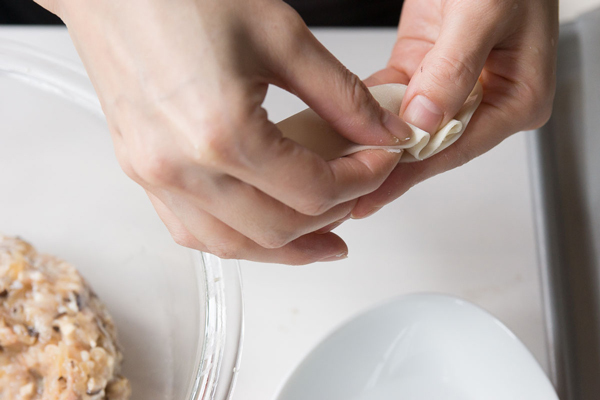 Serve the gyoza with the crisped side up to help them stay crisp for longer.